The competition has screening programs, special programs, and other events. 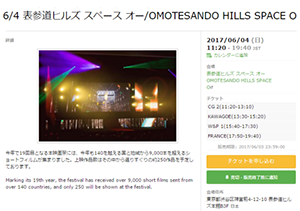 → Check the Screening Programs/Events page! If you have a preferred time you can also choose from the Schedule. You can book beforehand through the event ticketing platform Peatix. There won’t be many tickets for sale on the day, so it’s a good idea to get it sorted beforehand! If a screening sells out we will stop taking bookings. Show the receptionist the ticket booking page for the film you’re seeing. The seating is general admission, and will be different for each screening. The order of admission will be on numbered tickets handed out at reception. Some screenings will also feature Q&A sessions with the directors! The festival has official social media accounts! Tag us with the hashtag #SSFF! Short Film Seminar: What is "Cinematic"? What is "Cinematec"?